DOES YOU DOG HAVE SENSITIVE SKIN AND CAN'T HANDLE PERFUMES AND DYES OF REGULAR SHAMPOOS? Always digging and scratching after every bath? They may be having a reaction to the ingredients in the shampoo you are currently using. Many Veterinarians recommend using a perfume & dye free shampoo to help your pet's skin allergies. 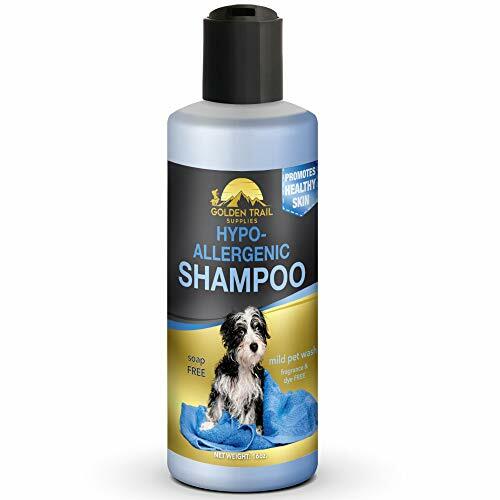 Our Hypo-allergenic shampoo is made with 4 natural ingredients. Palm Kernel Oil, Coconut Oil, Citrus Fruits & Vegetables that's it. It doesn't get any cleaner than that. NO SOAP & NO SULPHATES. We used PALM KERNEL OIL to add ladder to our shampoo, this is a natural oil extracted from the kernel of the Palm tree seed. It works as a cleaning agent and adds shine to your pet's coat with every shampoo. This is a very concentrated oil that sooths as it works. Great for sensitive skin pets restoring the natural oils in their skin. NO PERFUMES & NO ARTIFICAL FRAGRANCES. NO SCENT, No dyes, 100% natural from nature. CITRUS FRUIT creates beautiful hair, Lime is an anti-fungal and anti-septic. It keeps dandruff, flakes, redness, acne and skin irritation in check. Citrus ingredients work to strengthen hair by strengthening the follicles. Citrus also adds vitamin C into the skin which is responsible for healthy cell growth for your pet's coat. NO HARSH CHEMICALS & ONLY NATURAL CONDITIONERS. We used the benefits of PURE VEGATABEL Glycerin & COCONUT OIL which is derived from plant seed oils and are easily absorbed into your pet's skin. When used with other natural oils and ingredients, it can seal in moisture on the top layer of our pet's skin while the other oils work their way deep into our cells to provide long-lasting moisture. Providing a natural conditioner leaving your pets fur feel wonderful to the touch after their bath. View More In Shampoos Plus Conditioners. If you have any questions about this product by Golden Trail Supplies, contact us by completing and submitting the form below. If you are looking for a specif part number, please include it with your message.